Is there a more inviting performance space in Athens than the Melting Point? Are there five guys in Athens with more jazz chops than the Athens Latin Jazz Quintet? And yet, we didn't stay last night beyond the first set. When we put on our wristbands at the door, the odds already were stacked against our sticking around. One, I was down on myself for making a hash of Satin Doll at the keyboard at the Ciné jam. I managed to redeem myself a bit with Miles Davis's Tune Up, but only with the generous help of Melvin and Art and their saxes. Two, we had a couple of thirteen-year-olds in tow, and their appreciation of jazz is, shall we say, still developing. Three, we were still in the throes of PADS -- post-Athfest distress syndrome. We grabbed a table stage right, not too close to the speakers, and the odds quickly increased that the evening would prove challenging. We ordered soft drinks -- two Diet Cokes and two Sprites. What the server brought had the coloration of Diet Cokes and Sprites, but neither the fizz nor the taste. Apparently, the fizz thing was on the fritz. It happens. But the replacement drinks were nothing to write home about, and Pat had the impression that the server had better things to do than to bring her a water to replace a "Diet Coke" that obviously had developed the tell-tale two-tone look of the abandoned soda. We ordered. Pat picked the turkey wrap. Ian and I succumbed to the siren song of the Cuban pork sandwich. I don't remember what Chad chose. "After awhile," as we say down here in Georgia, the food came. The longish interval between the handing back of the menus and the arrival of the edibles was no big deal, at least for me. I wasn't starving. And maybe they plan it that way to allow you to enjoy the music a bit before you dine. Anyway, the food came, and I reached for the right half of my Cuban pork sandwich, anticipating that glorious moment when the toasty warmth of tender meat and melted cheese would dock with my taste buds. But when my fingers closed around that sandwich half, well, room temperature is not toasty warmth. Later, during our debriefing, Pat said that her turkey wrap, which should have had a chilly freshness, also was room temperature. The lettuce was room temperature. The turkey was room temperature. On the plus side, we all devoured our fries and onion rings. They were special and yummy. Technically, the quintet rocked. The rhythms were locked in the groove, Preston pulled some sweet solos from the bass, and Rand had a really inventive night at the keyboard. The full house gave it up for the guys enthusiastically. But there I sat, a bit disappointed. For one thing, my ears never really adjusted to the acoustics of the performance. The quintet seemed to be playing in a cave. I don't know whether it was the construction of the performance space or where we were sitting or the way the sound board was set or that my ears are still recovering from Athfest, but the keyboard and the vibes sounded tinny, and I didn't get nearly enough differentiation among instruments. Also, I think there might be a missing piece in the make-up of the group. I'd like to hear them as a sextet, adding a horn, or maybe as a quintet with a vocalist out front for some of the numbers. Don't forget -- coming up tomorrow! 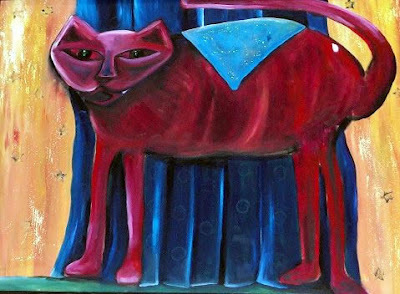 Your chance to check out some cat themed art and even bid on stuff including this huge mixed media cat painting (from yours truly) as well as an ORIGINAL Pete the Cat item from James Dean. Cat themed art donated by local artists, including Robin Fay, James Dean, Cecile Moore, Josh Payne, Cathy Dailey and more! Pieces will be on display and for sale through the month of July. Proceeds benefit the non-profit group Cat Zip Alliance.Earth Fare on Lumpkin St.
Over at my athensview.com, I'll be serving up some of my images from a Sunday afternoon at Athfest. I'll feature a new image every quarter hour. A few minutes ago, Pat woke me from my second nap of the morning (too much Athfest). Our black lab, Pepper, had begun sniffing the air in the backyard. She'd sniff, then move, then sniff. She sniffed her way to a big tree near the garage. She'd found this little critter, a baby possum. Come listen to the piano player on College Square. Not everybody's headed downtown to Athfest today. Pat found this little one in a backyard flower pot this morning. What a cooperative model! Stayed right there throughout a long shoot and even turned sideways for a profile at one point. Every quarter-hour today, I'll be posting a new image from my Friday evening at Athfest. Drop by athensview.com to check out the Athfest scene from my point of view. Registration is now open for The Fishing Creek Outfitters Throwdown, a dock diving event presented by Dixie Dock Dogs, August 28-30, 2009. You will find more info on the event at Dixie Dock Dogs . Dixie Dock Dogs is a non-profit organization benefiting various canine charities, among them being Chase Away K9 Cancer . For further information regarding participation or sponsorship of this event, or joining our club, please contact me by email at skyhawk@dixiedockdogs.com or call 706-540-6539. Ian and I are just back from a noontime stroll along the 40 Watt end of Washington St. The set-up crews are already hard at work getting things ready for the 5 p.m. kickoff of Athfest's outdoor music. Update on June 25: We're no longer looking for this guy. Please cancel the previous lookout. The suspect has been identified as Richard Looney, 37 years old, of Nicholson, Ga. He has been arrested and charged with robbery for these incidents. On June, 24 around 11:00 p.m. Papa John’s Pizza, 498 Baxter Street, was robbed. The suspect was described as a white male in his 30’s, curly hair, beard/ goatee, wearing a black tank top, white shorts, and black tennis shoes. He has a large tattoo on his right upper arm. He was seen driving a black Ford Taurus. Crime Stoppers is offering a reward of up to $1,000 for information leading to the arrest and conviction of the suspect. Anyone with information on this subject is asked to call Sgt. Jerry Saulters at (706)613-3888 Ext. 296. What dreams do you have for your neighborhood, for your city? What changes—or non-changes—would you like to see in your neighborhood? In the city? Last week on My Athens I posted a map showing my dreams for my neighborhood. Now, I want to see what others are daydreaming about. If you live in Athens, Ga., show me—send me—your ideas. Send me a hand drawn map highlighting where you’d like a park in your neighborhood. Or use Google Maps to create a map showing how you’d change zoning throughout the city and send me the link. Or compile a list of suggestions for improving downtown or the Prince Ave corridor or wherever and email it to me. If you want to do something as elaborate as I did last week, that’s fine. But very loose, free-hand, not-to-scale sketches like the one above (which, by the way, is intended only to illustrate what a hand-drawn map could look like and is not to be taken as a serious prediction) are perfectly acceptable. If writing is your preferred mode, this post I did about Lexington, Ky.—where I used to live—might serve as an example. But—again—something shorter, less punctuated, is good, too. My plan is to occasionally post what you send to me—with your name attached (unless you prefer anonymity)—and then maintain an archive of what I’ve collected. If you’re creating a map by hand, please email me (lorentz.d@gmail.com) a scanned copy in a jpeg, pdf or tiff file. To mail your hand-created map, email me to get my address. Don’t send any hard-copy pictures larger than an 8.5 x 11 page—that’s all my scanner can handle. Kevan Williams, Flagpole’s development columnist, suggested I do something like this. It’s a good idea. Send me your ideas. Many thanks to everyone who voted in my informal poll on your info sources for the Georgia Theatre fire story. Click here for the results so far. Proceeds benefit the non-profit group Cat Zip Alliance. Both events will be at Earth Fare on Lumpkin St.
As many of you know the Campus Cats and Kitty Crusaders have formed to manage and control the local feral cat population many of which reside in the campus / downtown area. They practice Trap-Neuter-Release (and also vet & vaccinate cats during this process), while finding homes for any adoptable kittens. This not only is helping to keep the feral cat population size down but helps in reducing the spread of cat diseases such as Feline Leukemia and Feline HIV. So, these are very good folks working tirelessly for a good cause! Don't forget the veggies! It's farmers market morning out at Bishop Park. Fresh produce, fresh coffee, fresh music, fresh faces. The most delightful place in Athens to start the weekend. Some of the best local skaters and some phenoms from elsewhere will be donning pads and helmets tomorrow at the Skatepark of Athens on the east side for the Concrete Rodeo, a touring contest that then heads for Brook Run in the ATL on Sunday. Local photographer Jason Thrasher (pictured) was out at the skatepark yesterday evening to get in some runs and to photograph Florida skater Will Powers, who's in town to help with the Rodeo. Check my skate pix blog for more photos. The Georgia Theatre burned this morning. The Georgia Theater caught fire around 0700 this morning. The Athens-Clarke County Fire Department is still working on extinguishing the flames. The Police Department is requesting that all citizens stay out of the Downtown Business District until the fire has been put out. There is a power shortage in the District and it is expected to stay out until late afternoon. Please treat all out traffic lights as four way stops. Please refer any questions or concerns to the ACC Fire Department. 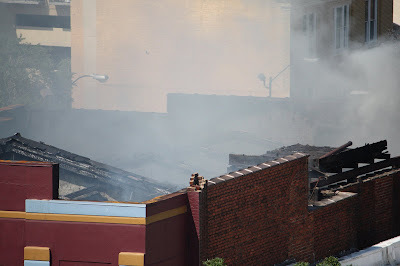 Tweets and blogs are starting to post that the Ga Theatre is on fire and flames are threatening surrounding buildings. Any other info? Over at athensview.com, I'm posting an assort of images from my archive, including this one of goslings at Memorial Park. Drop by. The Georgia Supreme Court has voted to allow the noise ordinance challenge filed by University of Georgia students to stay dismissed. Robert Manlove and William Hoffman challenged the constitutionality Athens-Clarke County noise ordinance last year by filing suit in Clarke County Superior Court. However, the Supreme Court by a vote of four to three agreed with the county government that the students did not have the right to bring the suit because they had never been issued a citation. Manlove and Hoffman's attorney Charles A. Jones Jr. explained in a statement that "the Court did NOT uphold the Ordinance itself, only ruled that my clients were not the proper persons to challenge the ordinance." Jones believes that there may be another opportunity to challenge the ordinance by someone who does receive a ticket for violation. Chief Justice Leah Sears wrote a lengthy dissent explaining why the threat of a citation should be sufficient harm to allow Manlove and Hoffman to allow their challenge to be heard in court. She also acknowledged that the Athens-Clarke ordinance has potential problems that could be considered by a court, pointing out that it prohibits sounds from being heard farther than five feet outside of an apartment at any time of the day, even though such a restriction does not apply to single-family homes and it applies downtown despite all the noise that is allowed there until late at night. Many Athens residents have expressed the view that the challenge is frivolous and misplaced. For instance, the Athens Banner-Herald reported on January 25, 2008 that "The challenge 'defines a frivolous lawsuit,' Athens-Clarke Commissioner David Lynn said." To this view Jones said, "The issue was very close, and the fact that three Supreme Court Justices agreed with our position demonstrates that this case is not the 'definition of a frivolous lawsuit' as some have suggested." I would like to point out that the legal challenge was not about whether a noise ordinance is constitutional at all; rather, it was about whether this noise ordinance is constitutional. I have compared the Athens-Clarke County noise ordinance to other noise ordinances, and it is unique. It is not the copy of an ordinance which has survived a challenge. It has unique and restrictive rules as well vague terms, problems that other noise ordinances do not have. Our community's proper response to the challenge brought by Manlove and Hoffman is to acknowledge the ordinance's defects and urge the Mayor and Commission to replace it with a more clear and sensible ordinance. Athens Banner-Herald: "High court rejects challenge to noise ordinance"
Red and Black: "UGA students lose noise ordinance challenge in Georgia Supreme Court"
Monday morning's a good time to give thanks again for the Athens venues that serve up live local jazz week in and week out. If you have the time, why not support America's music by joining the audience at one of these venues this week? Sundays: Brunch jazz at Square One Fish Co.
For more on these gigs, check out my calendar. Drummer Carlton Owens brought his trio (our friends Dennis Baraw on the bass and Rand Lines on the keyboard) to the bricked patio of the Square One Fish Co. on Thomas Street this afternoon, adding a spicy jazz garnish to the well-prepared and presented brunch entrees. It turns out that our old friend Arva manages the new eatery. Small world! She’ll do a great job. She’s already doing a great job, judging from my grits and shrimp and Pat’s Caribbean shrimp salad. I ate every single bit of mine. Shouldn’t have, but did. Great music, guys, as always. And Arva says jazz will be on the menu every Sunday brunch. Sweet. We’ll be filling up our frequent eater card very soon. For more photos, check my jazz blog. As Pat and I returned from the farmers market yesterday morning, we cruised by the new Athens eatery, "Square One Fish Co.," on Thomas Street just north of the Classic Center. A solitary young man -- wearing a white apron, I think -- was hosing down the lovely-looking outdoor dining area. There's something urban-pastoral about the morning rituals of downtown restaurants -- young folks (and not-so-young folks) sweeping up, placing chairs and tables, arranging condiments, dressing a city for another day. Anyway, we were doing some recon. Our plan is to do brunch at Square One today, partly because there's jazz on the menu. Maybe we'll see you there. Reminder: The farmers market at Bishop Park opens tomorrow (Saturday) at 8 a.m. This week's musical guests are the Athens Folk Society Band and Lera Lynn of Birds and Wire. See you there! The Classic City Rollergirls are looking to start their home season off right this June with a win over the rollergirls from Charleston, SC. "Lowcountry Brawl" will pit the High Rollers from the Lowcountry against the Athens rollergirls for the first time. A portion of the proceeds from "Lowcountry Brawl" will help support HandsOn NE Georgia, the CCRG sponsored charity for the 2009 season. HandsOn NE Georgia helps individuals, families and corporate and community groups find flexible volunteer opportunities at various organizations in Athens-Clarke and Oconee Counties. Hands On Northeast Georgia volunteers are at work every day of the year building the community and meeting critical needs in schools, parks, senior homes, food banks, pet shelters, low-income neighborhoods and more. CCRG is proud to sponsor this incredible organization for the entire season. On Saturday, June 13th the Classic City Rollergirls will compete in their first home bout of the season against the Lowcountry High Rollers from Charleston, SC. "Lowcountry Brawl" will feature 2 periods of fast-paced roller derby. The action begins at 7pm (doors open at 6pm) at Skate Around USA, 3030 Cherokee Road, in Athens. Roller Derby is family friendly so bring the kids! Admission at the door is $10 for adults, $5 for children 6 – 10 and children under 6 are free! Adult tickets can be purchased in advance for $8 through any rollergirl or online. Please also join the rollergirls for the after-party at Kingpins in the Homewood Hills Shopping Center. In anticipation of Athfest 2009, I'm revisiting my images from last year's event. Here's a shot of Heidi Hensley in overdrive. I've been rummaging through my photo archives for images to display on my new tumblr blog, athensview.com. This afternoon I came across an image that strikes me as especially evocative, capturing something of what makes a walk downtown so enjoyable on a weekend morning. If you haven't been a regular out at SPOA (the Skatepark of Athens), you might wonder just who the daredevils are that you glimpse on the way to a soccer match or a softball game. Let me introduce you to one of them. He's Jason Steelman, a college student who lives in Oconee County. Jason's just back from a semester in Quito, Ecuador, honing his language skills and doing a bit of skating as well. Here's his take on skating in Ecuador. Will someone please fill us in on the developments at Tasty World? A Saturday morning stroll through the Bishop Park farmers market has congealed from lark to ritual for us. We filled our Publix bag with veggies and flowers, lingered in the music corner to hear Hope for a Golden Summer, sipped some 1000 Faces coffee, chatted with old friends and new, and snapped some pictures. The Athens Downtown Development Authority (ADDA) will host a public information open house to view conceptual plans of the proposed downtown Parking Deck and Mixed-Use Facility to be constructed on Lumpkin Street between Clayton Street and Washington Street. The open house will take place on Tuesday, June 16 with a drop-in format from 5:30 until 7:00 p.m. at the Dougherty Street Governmental Building Auditorium at 120 West Dougherty Street. Members of the ADDA, along with SPLOST Program Management staff, will be available to review information about the project and answer questions. Citizens throughout the community are encouraged to attend and learn more about this project and what it means to downtown Athens.